Is your little girl growing up with a fascination for plants? Does she almost seem to prefer talking to flowers over the other kids in her class? Well, that doesn't sound odd to us, not in the least bit. In fact, she reminds us of one of the strongest females to ever enter the comic book worlds. We are, of course, talking about the infamous Poison Ivy! All too often does Poison Ivy get a bad reputation... it may be due to her self-proclaimed life-long mission of 'purifying' Gotham, making it a better place for plant life to grow prosperously without human interference but, hey, we get it, plant-life is pretty and kind of necessary for the earth to survive. So who is the real villain?... Think about that one for a bit. A lot of people fail to remember that Poison Ivy can actually be a positive and motherly role model. After a devastating earthquake, she actually took care of a number of orphans and provided produce to the starving population of the ruined city! See? She's not all bad, maybe just a bit misunderstood. 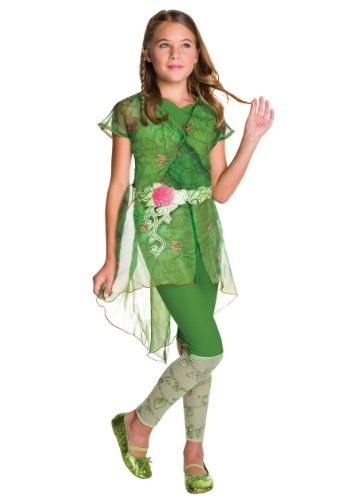 Now your little princess can look just like the most powerful tree hugger in all of fiction with this Poison Ivy Deluxe Costume, and maybe even help to clean up the villainess' reputation a bit! Who knows, maybe she'll even develop the ability to manipulate plant life with her mind! Imagine how beautiful your garden could look! Even if those powers fail to develop, your little girl can still look like one of the most powerful women in all of DC's universe with your help! Once she has this Deluxe Costume, all she needs is a red wig and a few accessories to add even more green and plant-life to her outfit, and it will seem as if she jumped right out of the panels from your favorite Batman Comic!